Marquette travels to Columbus, Ohio, on Tuesday for a tilt with Thad Matta’s Buckeyes. Last season’s matchup was nothing short of a disaster for the Golden Eagles. After tying the Buckeye’s 19 points in the first half, the Blue and Gold were outscored by 17 in the second half for a 52-35 loss. This was the lowest scoring Marquette defeat since getting trapped in the vortex that is Jim Boeheim’s zone in the 2013 Elite Eight. The rematch promises to be a much higher scoring affair. Last season both teams shot a combined 4-36 from behind the 3-point stripe. The additions of Matt Carlino, Duane Wilson, and the emergence of Jajuan “TreyJ” Johnson should allow for more makes from long range. Lockdown perimeter defender and ESPN sweetheart Aaron Craft is gone, leaving more time to get shots off, and about 30 minutes of extra air time that announcers will need to fill. Despite this, Marquette has a nigh insurmountable task trying to take down “the” Ohio State in their house. Paint Touches has assembled everything a Warrior needs to know about those Buckeyes. The Game Plan: If Marquette wants to win this game, it needs to, first and foremost, take care of the ball. What Marquette did to UT Martin on Friday is what Thad Matta likes to do to every opponent. Aaron Craft is gone but Shannon Scott is every bit as fierce of a defender. And D’Angelo Russell snagged three steals in his college debut. Thad Matta traditionally has run a man-to-man defense, but made the switch to zone this season. This means MU needs its shooters to step up…Matt Carlino, you have the green light. Ohio State only has one true center, Amir Williams, and he looked less than inspired in the season opener. The rest of Thad Matta’s crew is made up of very tall switchables. Rebounding is going to be an issue unless Juan and Steve can channel their inner Lazar Hayward and stay out of foul trouble. Of course if they do pick up fouls, the Buckeyes aren’t great at hitting their freebies. Best Case: Carlino, Duane, Juan, and TreyJ come out on fire. Carlino looks like his old BYU self and nails 4 treys on 8 attempts. Burton’s mix of speed and strength allows him to get around the bigger Buckeyes for some patented #bane moments. Burton also uses his newly found ability to kick out after a drive to set up a couple of open threes. Juan and #freestevetaylor manage to pull down 8 rebounds each…meaning the Warriors only get outrebounded by 9. Shannon Scott is aggressive on the ball but Derrick and Carlino keep the ball away from him and exploit the holes in the zone. The Buckeye freshmen look like, well, freshmen. Russell makes some ill-advised drives leading to turnovers and Bates-Diop is consistently out of position on defense. 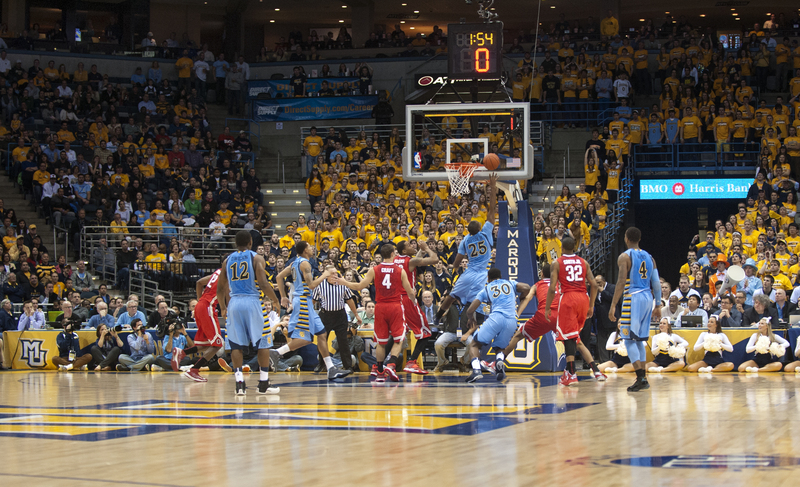 Marquette shocks the Buckeyes with a five point victory. Worst Nightmare: Carlino and Derrick try to rush the zone and it leads to a bunch of sloppy turnovers. Turnovers lead to the announcers repeating the phase “Slam Thompson” four or five times throughout the night. The Juan and Jajuan show gets cancelled after the pilot as they revert to their 13-14 selves. D’Angelo Russell continues his campaign to be a one and done and drops 15 on the Marquette D. Amir Williams gets a double double with points and rebounds exclusively gained from easy putbacks. Taylor fouls out after 10 minutes of playing time. Buckeyes rout the Warriors by 22. How dare you! Marquette does not lose.